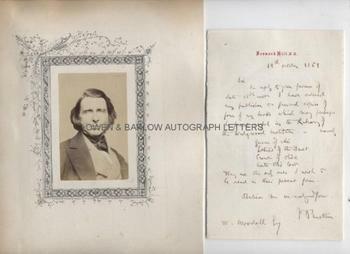 JOHN RUSKIN Autograph Letter Signed. English art critic, writer and artist. Champion of the Pre-Raphaelite Brotherhood and also instrumental in bringing J.M.W. Turner to public notice. ALS. 1p. Denmark Hill, S.E. To William Woodall. Together with a contemporary portrait photograph. 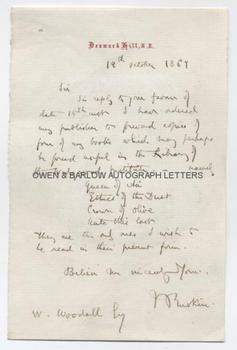 "In reply to your favour of date 15th inst. I have asked my publisher to forward copies of four of my books which may perhaps be found useful in the Library of the Wedgewood Institute. Namely: Queen of Air; Ethics of the Dust; Crown of Olive; Unto This Last. They are the only ones I wish to be read in their present form." 8vo. Approx 7 x 4.5 inches. Very slight mounting traces on verso, else fine. The photograph is an albumen silver print of carte de visite size, laid down on card within a border of fine original penwork decoration. Both the letter and the photograph are from a 19th century collection compiled by the radical Liberal M.P., William Woodall. 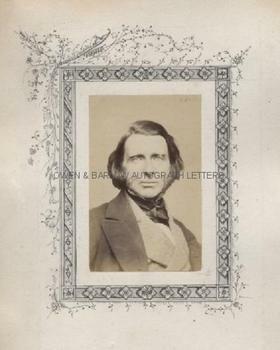 John Ruskin writes in reply to an appeal by William Woodall for books for the Free Library of the Wedgewood Intitute, of which Woodall was a trustee.